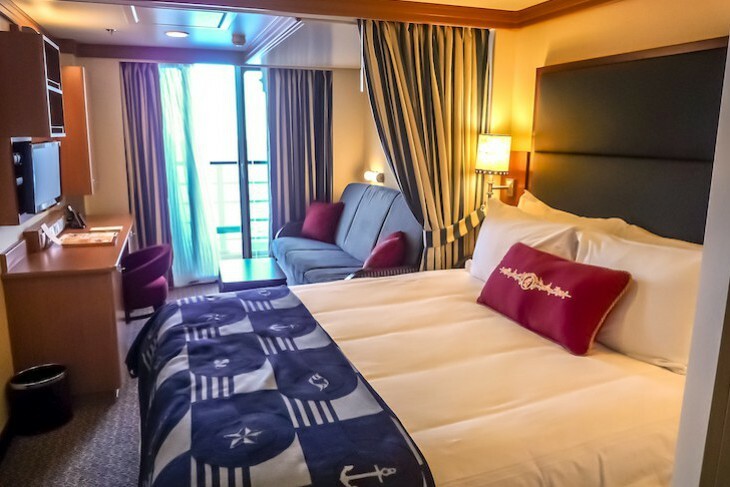 Disney Dream and Disney Fantasy offer 1,250 staterooms and suites (70 percent with verandahs), among the first in the industry to be designed especially for families. 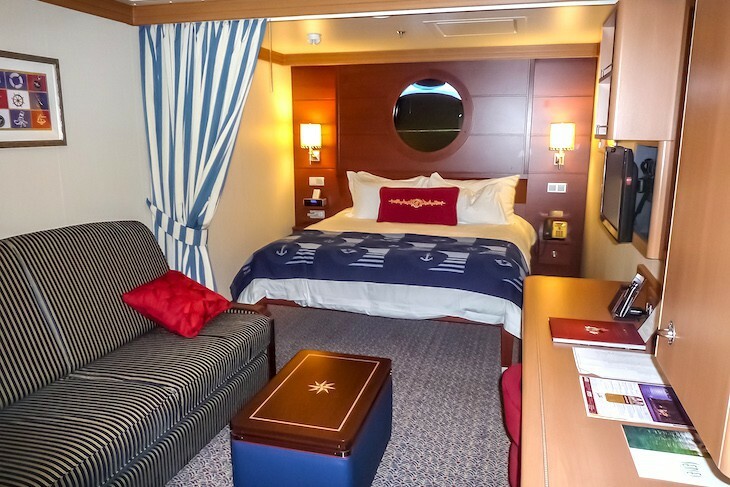 In all except concierge staterooms and suites you’ll find a nautical décor in a palette of blue and red with light wood furnishings. 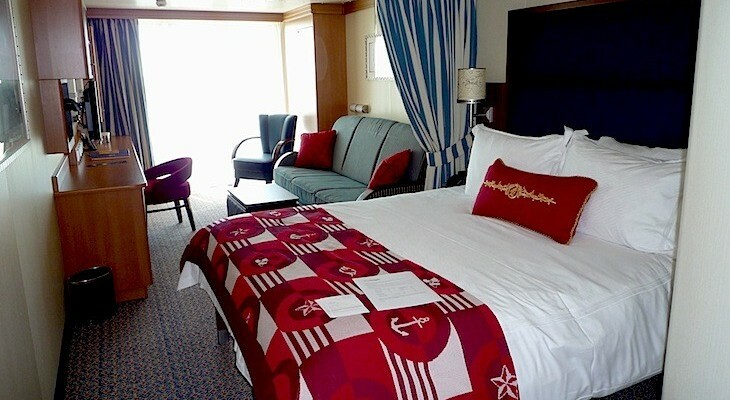 Standard stateroom baths are decorated in white tile with blue and red accents and most offer a bath-and-a-half design: one bath with a vanity, sink, and full tub/shower; and second bath with a vanity, sink, and toilet. The split-bath configuration makes all the difference when the entire family is trying to get ready at once, and many staterooms have a round tub/shower with a built-in seat perfect for giving little ones their bath. Luggage fits nicely under the bed, there’s loads of drawer and shelf space, and even the coffee table opens to reveal a hidden storage area. Closet space is sufficient but not as large as perhaps it could be. 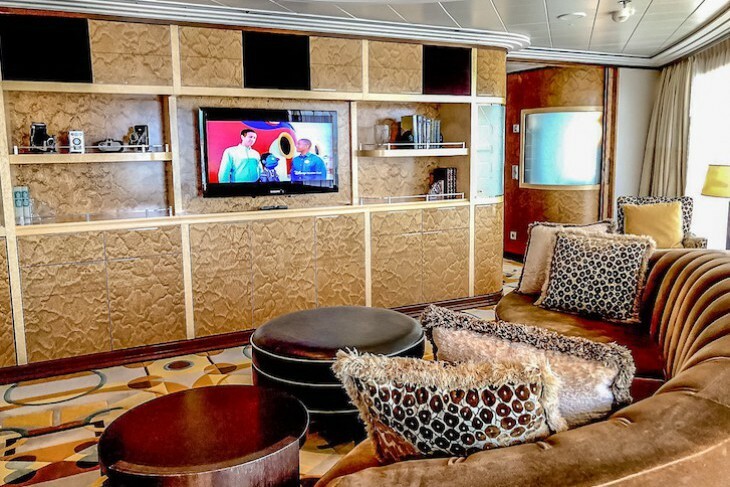 Staterooms have crown molding, teak accents, and nice wood finishes. Super comfort queen beds are adorned with padded leather headboards and made with soft Frette linens and duvet along with plush pillows. All feature a 22” flat-screen TV, iPod docking station clock, mini fridge, H2O toiletries, electronic safe, and two Wave Phones for onboard, wireless communication. There's even a private Jacuzzi for your enjoyment! 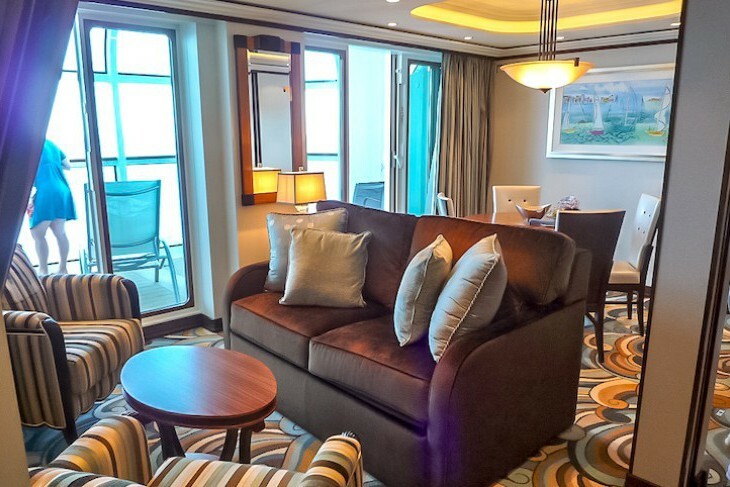 Category 4, Deluxe Family Oceanview Staterooms with Verandah. 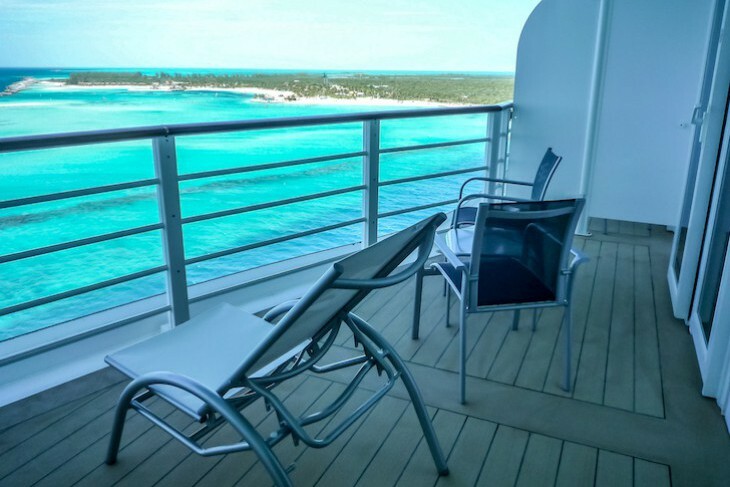 Located on Decks 5 through 10 sleeping three to five with 299 square feet including the verandah. Queen bed, single sleeper sofa, and pull-down bed in some. Split bath with round tub and shower in most. 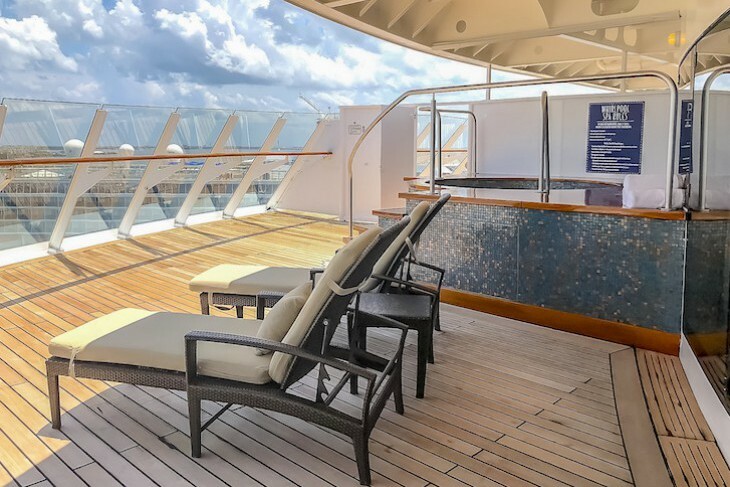 Deck 5’s Category 4E offers a deeper verandah space due to it’s location over the Deck 4’s promenade, although the interior cabin space is similar to the Deluxe Oceanview Staterooms; perfect for those wanting more exterior rather than interior space. Category 5 and 6, Deluxe Oceanview Stateroom with Verandah. Located on Decks 5 through 10 sleeping three to four with 246 square feet including the verandah. Queen bed and a single sleeper sofa; pull-down bed in some. Category 7, Deluxe Oceanview Stateroom with Navigator’s Verandah. This stateroom’s navigator’s plexi-glass verandah is somewhat enclosed with about one-fourth of your view obstructed. Located on Decks 5 through 9 sleeping three to four with 246 square feet including the verandah. Queen bed and a single sleeper sofa; pull-down bed in some. 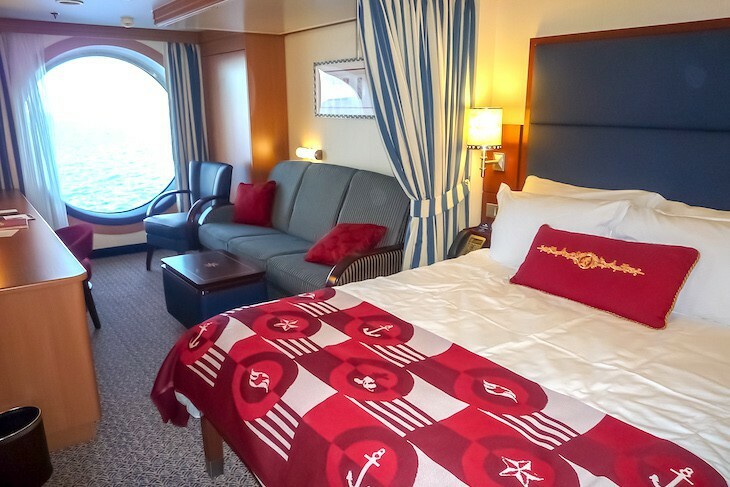 Category 8, Deluxe Family Oceanview Staterooms. 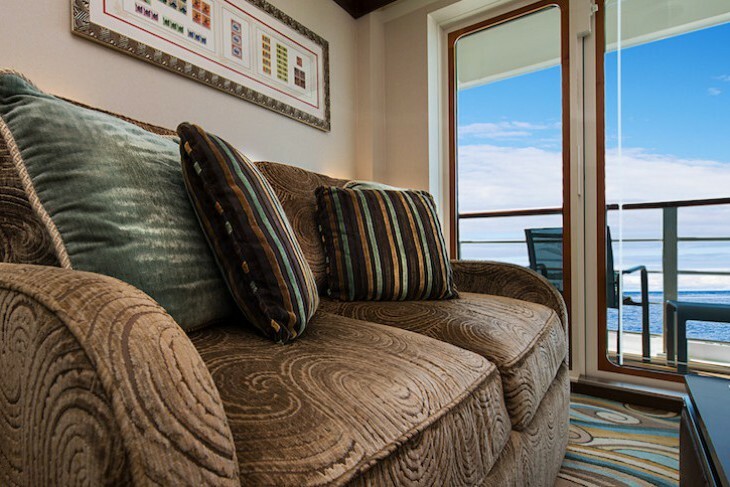 Located on Decks 5 through 10, sleeping three to five with 241 square feet. In Category 8B, 8C, and 8D you’ll feel as if the ocean is practically inside the room due to their massive porthole window (no verandah) which takes up almost the entire ocean-side wall of the stateroom with in-porthole seating (Category 8A has two square, less dramatic portholes). Baths have the bonus of a round tub/shower. 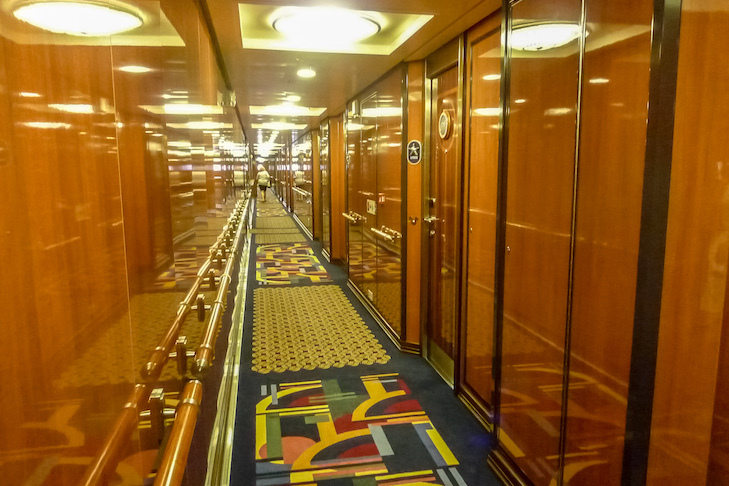 Staterooms on Deck 6 have the lifeboats beneath you; not blocking the view but a bit distracting. Queen bed, single sleeper sofa, and pull-down bed in most; upper berth pull-down bed in some. Category 9, Deluxe Oceanview Stateroom. Located on Decks 2, and 5 through 8 sleeping three to four with 204 square feet. Categories 9C and 9D have an obstructed view. Here portholes are smaller than those in a Deluxe Family Oceanview Stateroom. Queen bed and single sleeper sofa; pull-down bed in some. Category 10, Deluxe Inside Stateroom without a verandah located on Decks 5 through 9 sleeping three or four with 204 square feet. 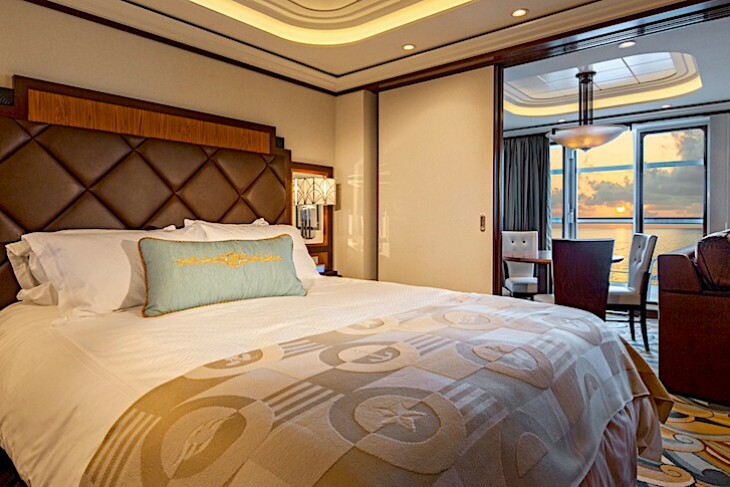 I’m not much for inside staterooms, but those on the Fantasy and Dream are the exception, each featuring a Magical Porthole providing a real-time view of the outside of the ship that reflects the actual stateroom's location, port or starboard. High-definition cameras placed on the exterior of the ship feed live video to an LCD flat-screen monitor with a stylized nautical frame cleverly disguised as a porthole. Be on the lookout for Disney animated characters that make cameo appearances, and when you want to sleep just turn it off with a flip of a switch. There’s even an astrological night sky light option when the bunk is dropped down. Queen-size bed and single sleeper sofa; upper berth pull-down bed in some. 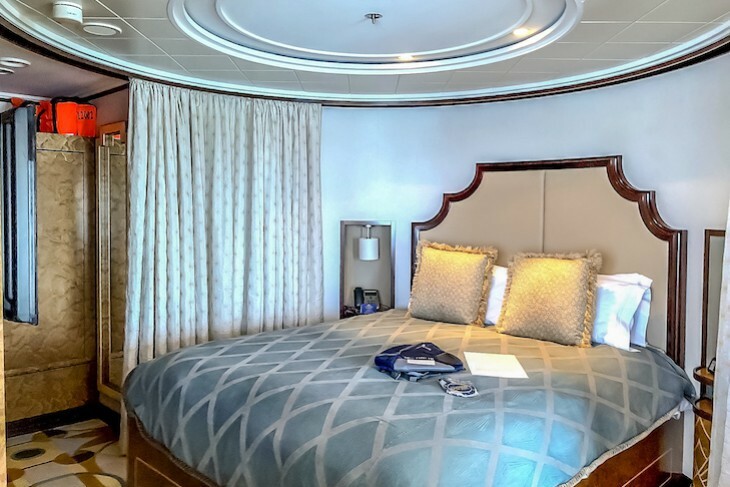 Category 11 Standard Inside Staterooms without a veranda are located on Deck 2 and 5 through 10 sleeping three or four with 169 square feet. 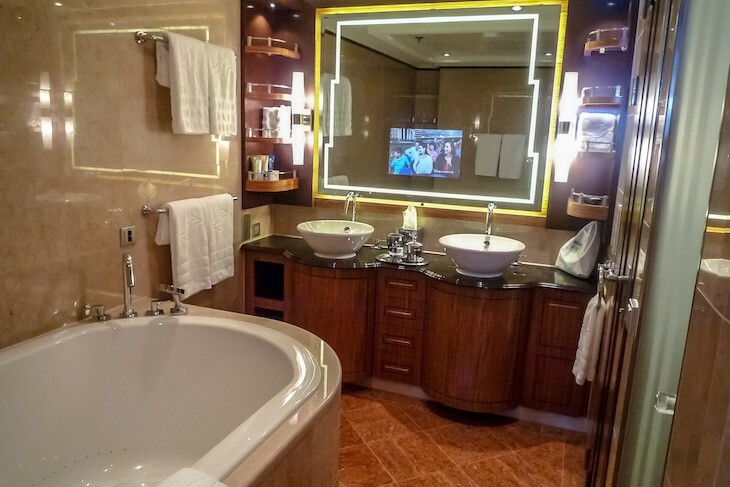 These staterooms also feature a Magical Porthole, but do not have a split bath. Queen-size bed and single sleeper sofa; upper berth pull-down bed in some. Shiny teak hallways, a dreamy palate of sea blue and chocolate brown, elegant furnishings, deep balconies ... this is what concierge guests, located on Deck 11 and 12, have to look forward to on their Disney Dream or Disney Fantasy cruise. Those ensconced in the ship’s twenty-one suites will also enjoy your choice of pillows as well as TVs integrated into bathroom mirrors. All suites come with two baths with the master featuring a giant-size whirlpool tub, rain shower, double sinks, and separate toilet area. Closets are walk-in, living areas feature a Blue-ray DVD player, and both the living and the master have a 42” HDTV. Balconies in all concierge staterooms and suites are deeper than standard staterooms and some balconies in the largest suites are absolutely gigantic, wrapping the front of the ship. Reserving a concierge stateroom or suite also comes with the following extra special amenities: concierge lounge with continental breakfast, lunch of sandwiches and beverages, afternoon snacks, evening cocktails and appetizers, and after dinner dessert; 100 megabytes of complimentary Internet per stateroom; access to the concierge sun deck from 7:00 am to 10:00 pm which features misters, lounge chairs, and refreshments, open to guests age 18 or older; in-stateroom breakfast, lunch or dinner available from any of the main dining rooms (guests of the Royal Suites have the additional choice of Palo in-stateroom dining); concierge pre-arrival services; priority tendering in applicable ports; and priority check-in. Category R, Royal Concierge Suite with Verandah (also known as the Walt Disney and Roy Disney Suites). Enter these two art-deco-styled suites through a marble foyer to the living room where you can’t help but notice sweeping views off the bow of the ship through floor-to-ceiling windows. Furnished in lovely burled wood, a curved chenille sofa in shades of gray, gold and green, an easy chair with ottoman, media library, 8-person circular dining table, wet bar, and oversized flat-screen TV, there are also two pull-down beds, a double and a single. In the kitchen are full-size refrigerator, sink, microwave, wine refrigerator, and cappuccino machine. The bedroom has a TV that raises and lowers at the foot of the queen bed, twinkling star lighting in the ceiling, reading nook, vanity, and walk-in closet as well as a master bath with double sinks, a rain/steam shower and whirlpool tub, a TV built into the mirror, and separate toilet area. Another full-size bath with a single sink and shower is found just off the entry. 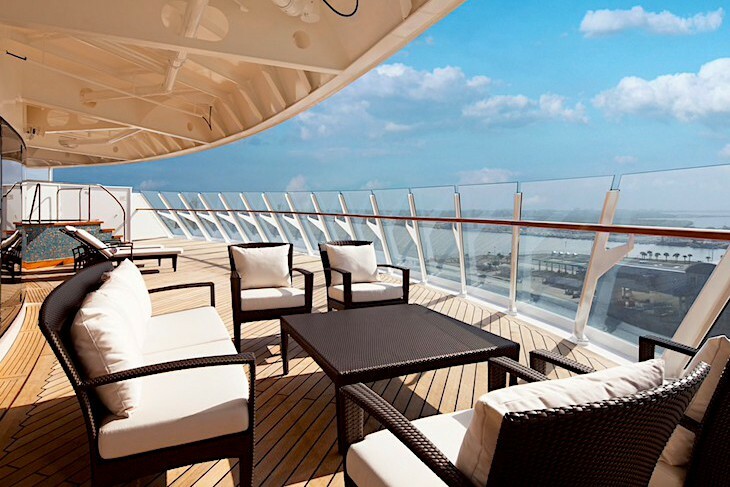 The massive, wrap-around verandah comes with a Jacuzzi tub and plenty of cushy lounge chairs. Located on Deck 12. Sleeps five in 1,781 square feet including the verandah. For a splendidly luxurious family reunion it’s possible to connect these two top suites with a central one-bedroom suite and two Family Concierge Staterooms to accommodate up to 25 guests with three suites and two staterooms basically wrapping the bow of the ship (the staterooms open to each other in the Suites’ foyer, and verandahs all open to each other if requested). Category T, One-bedroom Concierge Suite with Verandah. This is a superb choice if a bit of additional room, a separate bedroom, and additional bath is what you crave. The entry hall features two closets and a full bath with shower and single sink. You’ll find a queen-size bed and walk-in closet in the master, and a master bath offering two above-sink basins, whirlpool tub, separate shower, separate commode area, and TV built into the mirror. In the living area you’ll find a four-person dining table, desk, double convertible sofa, and a single pull-down bed. 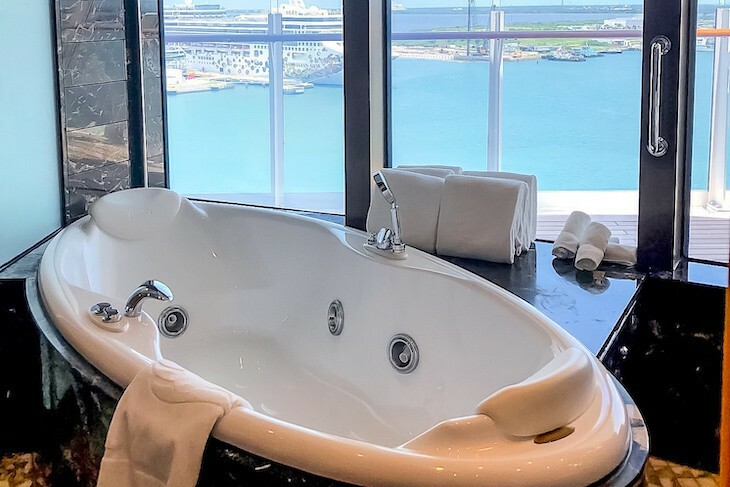 This can connect to a Concierge Family Oceanview Stateroom to become a 2-bedroom suite. Located on Decks 11 and 12 sleeping five in 622 square feet including the verandah. Category V Concierge Family Oceanview Stateroom with Verandah. Much like the non-concierge, Category 4 stateroom, but with upgraded décor and a deeper balcony, these accommodations offer a queen bed, mocha-colored chenille double sleeper sofa (realize that when the sofa is open you won’t be able to access the balcony without stepping over it), double sleeper sofa and upper berth pull-down bed in the living area, and a split bath featuring a round tub/shower. Located on Decks 11 and 12 sleeping five in 306 square feet including the verandah. Let Us Help You in Planning Your Disney Cruise Line Vacation! Allow me to connect you to the expert travel advisors at Glass Slipper Concierge to plan your Disney Cruise Line vacation. Your luxury Travel Advisor and Disney Destinations expert will work with you to create the perfectly planned trip of a lifetime, making sure that nothing is left to chance.